The polygon-mesh approach to 3D modeling was a huge advance, but today its limitations are clear. Longer render times for increasingly complex images effectively cap image complexity, or else stretch budgets and schedules to the breaking point. 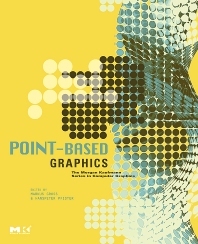 Comprised of contributions from leaders in the development and application of this technology, Point-Based Graphics examines it from all angles, beginning with the way in which the latest photographic and scanning devices have enabled modeling based on true geometry, rather than appearance. From there, it’s on to the methods themselves. Even though point-based graphics is in its infancy, practitioners have already established many effective, economical techniques for achieving all the major effects associated with traditional 3D Modeling and rendering. You’ll learn to apply these techniques, and you’ll also learn how to create your own. The final chapter demonstrates how to do this using Pointshop3D, an open-source tool for developing new point-based algorithms. Developers in games, film special effects, graphics hardware, 3D scanning, imaging, animation, and geometric modeling. Researchers in graphics, visualization, and imaging. Students in advanced computer graphics. Markus Gross is a professor of computer science and director of the Computer Graphics Laboratory of the Swiss Federal Institute of Technology (ETH) in Zürich. He received a master of science in electrical and computer engineering and a PhD in computer graphics and image analysis, both from the University of Saarbrucken, Germany. From 1990 to 1994, Dr. Gross worked for the Computer Graphics Center in Darmstadt, where he established and directed the Visual Computing Group. His research interests include point-based graphics, physics-based modeling, multiresolution analysis, and virtual reality. He has been widely publishing and lecturing on computer graphics and scientific visualization, and he authored the book Visual Computing (Springer, 1994). Dr. Gross has taught courses at major graphics conferences including ACM SIGGRAPH, IEEE Visualization, and Eurographics. He is the associate editor of the IEEE Computer Graphics and Applications and has served as a member of international program committees of many graphics conferences. Dr. Gross has been a papers co-chair of IEEE Visualization '99, Eurographics 2000, and IEEE Visualization 2002. He is chair of the papers committee of ACM SIGGRAPH 2005. Dr. Gross is a senior member of IEEE, a member of the IEEE Computer Society, a member of ACM and ACM Siggraph, and a member of the Eurographics Association. Dr. Gross is on the advisory boards of various international research institutes and governmental agencies. Dr Gross is a cofounder of Cyfex AG and Novodex AG. Hanspeter Pfister is associate director and senior research scientist at MERL (Mitsubishi Electric Research Laboratories) in Cambridge, MA. He is the chief architect of VolumePro, Mitsubishi Electric's real-time volume rendering hardware for PCs. His research interests include computer graphics, scientific visualization, and graphics architectures. His work spans a range of topics, including point-based graphics, appearance modeling and acquisition, computational photography, 3D television, and face modeling. Hanspeter Pfister received his PhD in computer science in 1996 from the State University of New York at Stony Brook. He received his MS in electrical engineering from the Swiss Federal Institute of Technology (ETH) Zürich, Switzerland, in 1991. Dr. Pfister has taught courses at major graphics conferences including SIGGRAPH, IEEE Visualization, and Eurographics. He has been teaching introductory and advanced graphics courses at the Harvard Extension School since 1999. He is Associate Editor of the IEEE Transactions on Visualization and Computer Graphics (TVCG), chair of the IEEE Visualization and Graphics Technical Committee (VGTC), and has served as a member of international program committees of major graphics conferences. Dr. Pfister was the general chair of the IEEE Visualization 2002 conference. He is senior member of the IEEE, and member of ACM, ACM SIGGRAPH, the IEEE Computer Society, and the Eurographics Association. MERL (Mitsubishi Electric Research Laboratories), Cambridge, Massachusetts, U.S.A.